Welcome to Codetapper's site, now featuring articles about the Amiga and the C64! The C64 section will be flushed out with more articles over the next few weeks. 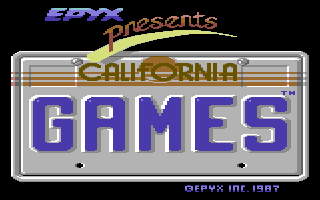 Programmer Chuck Sommerville claimed all pirated versions were based on the cassette version.Programmer Chuck Sommerville claimed that all pirated versions of California Games on the C64 were based on the cassette version, adding that the disk version still hasn't been pirated, and blaming US Gold for a dent in sales. After numerous requests from people over the years, a C64 section has been added to the website!After numerous requests from people over the years, a C64 section has been added to the website! The C64 is my original computer and second favourite machine of all time after the Amiga. Richard Aplin removed the alternative end-sequence from the Amiga version at the last minute.Richard Aplin removed the alternative end-sequence from the Amiga version at the last minute, figuring that it would be seen and printed in magazines and that it was a little bit risque for the time. By typing a specific code word into memory, the intro sequence changes from a story about rescue to a filthy version!By typing a specific code word into memory, the intro sequence changes from a story about rescue to a filthy version! An in-depth analysis of the differences between the 1988 and 1990 versions of Helter Skelter from Audiogenic.Audiogenic were notorious for re-releasing practically the same game multiple times on the Amiga (Impact, Graham Gooches cricket, World Class Rugby etc). Here's an in-depth analysis of the differences between the 1988 and 1990 versions of Helter Skelter. The most interesting thing is how the Teque programming team avoided having to use many sprite tricks!Only just qualifying for a sprite trick analysis, the most interesting thing about Pac-Mania is how the Teque programming team intentionally avoided having to use many sprite tricks at all! All 8 sprites were used to create a 16 colour score panel on the right hand side of the screen.All 8 sprites were used to create a 16 colour score panel on the right hand side of the screen. This allowed the game area to stay 16 colours and retained enough speed for some big enemies. 6 sprites are multiplexed across the screen to create a full screen scrolling background parallax layer.Programmer Stuart Cook enhanced the Amiga version by using 6 sprites multiplexed across the screen to create a full screen scrolling background parallax layer. The Atari ST version had a solid blue sky instead of the parallax background. Sensible Software added a secret message to the end sequence.Sensible Software added a secret message to the end sequence of Cannon Fodder, and a second to the publisher logo. In terms of gameplay mechanics, Paperboy must surely rank as one of the most ridiculous ever devised.In terms of gameplay mechanics, Paperboy must surely rank as one of the most ridiculous ever devised. If you think about what is actually happening in the game, almost everything in it is absolutely crazy. Defaced S.D.I. credits mystery solved! The mystery of who defaced the end credits screen in the Amiga version of S.D.I. finally solved!While patching the Amiga version of SDI to run from a hard drive, I noticed a hidden statue of liberty picture along with a vandalised end credits screen. The mystery of who did this began, and in late 2014, the mystery was finally solved! Programmer of Risky Woods, a game that featured an impressive 16 colour background pattern created with multiplexed sprites.Ricardo Puerto programmed the Amiga game Risky Woods for Dinamic back in 1992. Risky Woods featured a very impressive 16 colour background pattern created with multiplexed sprites. He also created the arcade game Biomechanical Toy, and a game for a theme park!